“Empa researchers, together with colleagues from the Max Planck Institute for Polymer Research in Mainz and other partners, have achieved a breakthrough that could in future be used for precise nanotransistors or – in the distant future – possibly even quantum computers, as the team reports in the current issue of the scientific journal “Nature”. A material that consists of atoms of a single element, but has completely different properties depending on the atomic arrangement – this may sound strange, but is actually reality with graphene nanoribbons. The ribbons, which are only a few carbon atoms wide and exactly one atom thick, have very different electronic properties depending on their shape and width: conductor, semiconductor or insulator. An international research team led by Empa’s [email protected] laboratory has now succeeded in precisely adjusting the properties of the ribbons by specifically varying their shape. The particular feature of this technology is that not only can the “usual” electronic properties mentioned above be varied – it can also be used to generate specific local quantum states. So what’s behind it? If the width of a narrow graphene nanoribbon changes, in this case from seven to nine atoms, a special zone is created at the transition: because the electronic properties of the two areas differ in a special, so-called topological way, a “protected” and thus very robust new quantum state is created in the transition zone. This local electronic quantum state can now be used as a basic component to produce tailor-made semiconductors, metals or insulators – and possibly even as a component in quantum computers. “The importance of this development is also underlined by the fact that a research group at the University of California, Berkeley, came to similar results independently of us,” said Gröning. The work of the US research team has been published alongside Gröning’s in the same issue of Nature. Based on these novel quantum chains, precise nano-transistors could be manufactured in the future – a fundamental step on the way to nanoelectronics. Whether the switching distance between the “1” state and the “0” state of the nanotransistor is actually large enough depends on the bandgap of the semiconductor - and with the new method this can be set almost at will. Ultrasmall transistors – and thus the next step in the further miniaturization of electronic circuits – are the obvious application possibilities here: although they are technically challenging, electronics based on nano-transistors actually work fundamentally the same as today’s microelectronics. The semiconducting nanoribbons produced by the Empa researchers would allow transistors with a channel cross-section 1,000 times smaller than typically manufactured today. However, further possibilities can also be imagined, for example in the field of spintronics or even quantum informatics. 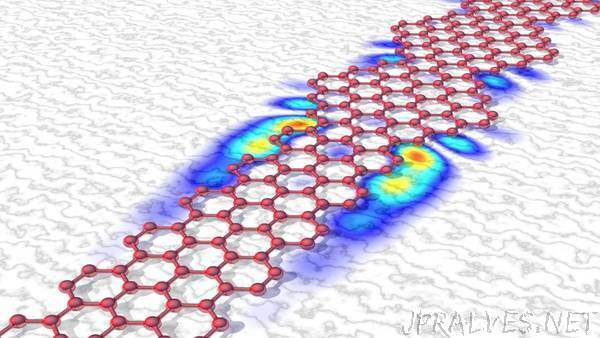 This is because the electronic quantum states at junctions of graphene nanoribbons of different widths can also carry a magnetic moment. This could make it possible to process information not by charge as was previously customary, but by the so-called spin – in the figurative sense the “direction of rotation” of the state. And the development could even go one step further. “We have observed that topological end states occur at the ends of certain quantum chains. This offers the possibility of using them as elements of so-called qubits – the complex, interlocked states in a quantum computer,” explains Oliver Gröning. Today and tomorrow, however, no quantum computer is built from nanoribbons – there is still a lot of research needed, says Gröning: “The possibility of flexibly adjusting the electronic properties through the targeted combination of individual quantum states represents a major leap for us in the production of new materials for ultra-miniaturized transistors.” The fact that these materials are stable under environmental conditions plays an important role in the development of future applications.